From left, are Dr. Lisa Willis, Dr. Brad Fields, Dr. Courtney Bronner Williams and Dr. Calvin Johnson, dean of the College of Veterinary Medicine. Four of Auburn University College of Veterinary Medicine’s outstanding alumni were recently honored with 2015 Young Achiever Awards, signifying their success in the first 10 years of their professional careers. 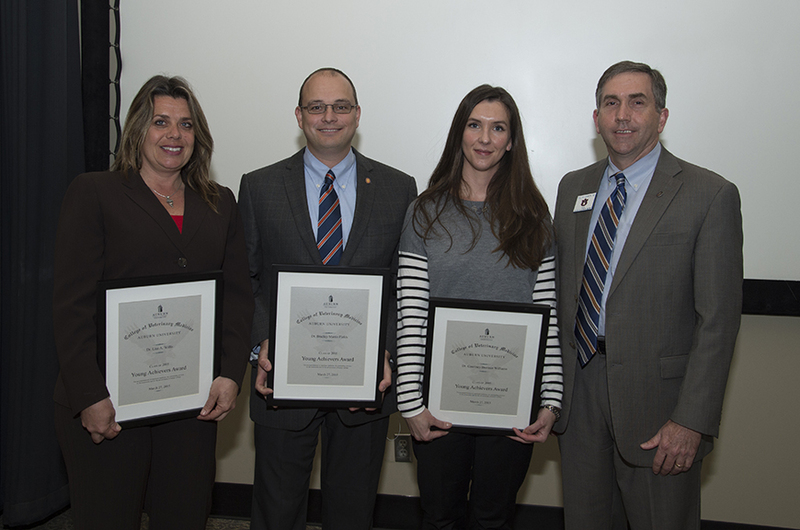 These alumni were recognized among their peers for their accomplishments in veterinary medicine, outstanding community service and in the advancement of animal health. The awards were announced during the 108th Annual Conference. Based on nominations, the awards committee of the college’s Alumni Advisory Council selected the following veterinarians from the class of 2005: Courtney Bonner, Bradley Fields, Stephanie McCain and Lisa Willis. Following veterinary school, Dr. Williams earned a master of public health at Emory University, which prepared her for a career with the United States Department of Agriculture as a Senior Staff Veterinarian, which she has held since 2007. In her position, Dr. Williams manages a national program for export of livestock, poultry, germplasm and companion animals for Asia, Oceania and parts of the Middle East. She also represents the U.S. government animal health authority in international animal trade discussions domestically and in foreign countries. Before joining the USDA, Dr. Williams worked for the Center for Disease Control and Prevention, serving as a veterinary educator. Dr. Fields has excelled in a number of career opportunities since earning the DVM from the College of Veterinary Medicine. He currently is director of Emergency Programs for the Alabama Department of Agriculture and Industries, executive director of the American Association of Small Ruminant Practitioners, assistant executive director for the Alabama Veterinary Medical Association and CEO of Tiger Oak, LLC, a professional consulting and veterinary services company. In addition, Dr. Fields has distinguished himself in the U.S. Army, currently as a major in the U.S. Army Reserves. He was awarded a Bronze Star Medal for service in Afghanistan. He earned the master in public health from the University of Alabama at Birmingham. He is also an affiliate professor at the Auburn University College of Veterinary Medicine. Dr. McCain received an undergraduate degree and DVM from Auburn University. Upon graduation, she completed a small animal rotating internship at Ordell Animal Hospital in New Jersey, and a one year avian and zoological medicine internship, as well as a residency in zoological medicine, at the University of Tennessee. In 2009, Dr. McCain joined the Birmingham Zoo where she serves as veterinarian. In 2012, she earned Diplomate status from the American College of Zoological Medicine. While at Auburn College of Veterinary Medicine, Lisa Willis helped organize the student chapter of the Society of Theriogenology and since graduation, she has worked in a large food animal referral practice before opening her own large animal private practice in Gustine, Texas. She is an active member of the American Association of Bovine Practitioners, the Academy of Veterinary Consultants and the Society for Theriogenology. She served as a consultant for rodeo stock breeders and contractors. Veterinary students from Auburn as well as other veterinary programs frequently request externship opportunities with Dr. Willis because of the respect and expertise she has gained in the area of bovine sports medicine.